It was a familiar story at Hillsborough as the Owls failed to make chances and possession count as they battled out a goalless draw with Birmingham. The outcome seemed inevitable for large swathes of the game as both sides lacked the real quality needed to unlock the other. And as the final whsitle approached the visitors seemed happy enough to come away with a point. Both Wednesday and Birmingham had chances to win the game, but the Owls’ were arguably more gilt-edged. Atdhe Nuhiu in particular missed a glorious chance with 12 minutes to go and went close on several occasions throughout. But ultimately, Wednesday’s goal-shy nature in front of their own supporters proved telling again as they failed to add to their paltry seven goal Hillsborough total for the season. The Owls had much the better of the play but could not find the breakthrough during a goalless first half. Wednesday controlled much of the possession for the majority of the first 45 minutes and went close to going in front through Jacques Maghoma. But visitors Birmingham finished the half the stronger with Clayton Donaldson and David Cotterill having good chances to put them in front. Short, zippy passing was the main feature of the Owls’ play over the first half an hour, despite a horrendously bobbly pitch at Hillsborough. But chances were few and far between. After patient build-up, Chris Maguire whipped in a cross, Nuhiu rose and turned a header wide from 15 yards out. Debutant Will Keane was central to much of Wednesday’s early attacking play, dropping deep to collect passes from the likes of Lewis Baker, who was handed his first start for the club. And the pair almost combined to put Wednesday in front after 16 minutes. Baker slid a pass through a crowd of bodies with Keane collecting only to be robbed of the ball by Paul Robinson. Birmingham suffered a blow on 19 minutes when former Owls defender Michael Morrison was forced off through injury. Jonathan Spector replaced him. Wednesday were inches away from taking the lead. Lovely interplay between Keane and Nuhiu saw Maghoma released into the area and after skipping past a challenge he hooked a shot towards the bottom corner which was touched wide for a corner. The visitors’ first real attempt on goal came with a speculative effort from Andrew Shinnie on 33 minutes. He drilled a shot from 25 yards which curled well away from Keiren Westwood’s goal. The Blues would grow into the game and threatened close to half time. First, after a good move on the left, Donaldson darted across the box to meet a low cross but was just beaten to the ball by Joe Mattock with the goal at his mercy. And from the subsequent corner, Cotterill cut in from the left and drilled on goal with Westwood producing a fine save to tip the ball over. 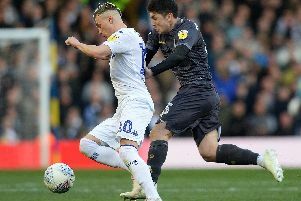 Wednesday failed to find their flow again after the break as the game descended into somewhat of a scrap at Hillsborough. Both sides struggled for fluidity during the early stages of the second half but each had a decent chance during the first ten minutes. Maguire curled a free kick narrowly wide from the edge of the box after Nuhiu was dragged down by Spector. And at the other end, Donaldson could not turn his header on target for Birmingham after a cross from Cotterill. Baker was almost put in on goal by a Nuhiu flick on but the pressure from on-rushing keeper Darren Randolph saw the Chelsea loanee drill wide. Demarai Gray managed to get a shot away after dancing into the area for the Blues but failed to trouble Westwood. Nuhiu went close to breaking the deadlock in a game that appeared to be there for the taking heading into the final quarter of an hour. The towering forward chested down a lofted ball to the edge of the box and powered a low shot that zipped just wide. The Owls had suffered a blow moments early when the lively Keane was forced off with a head injury. Stevie Mayreplaced him. Nuhiu really should have put Wednesday in front with 12 minutes to go at Hillsborough. Liam Palmer sent over an inviting cross after May’s shot was blocked and Nuhiu rose but powered his header over the bar from six yeards out. Birmingham appeared content enough to waste time in the dying moments but they did have the final attempt on goal. Cotterill drilled a long range free kick on target but Westwood had it covered. Owls: Westwood, Palmer, Lees, Loovens, Mattock, Maguire (Helan 60), Baker, Semedo, Maghoma, Nuhiu, Keane (May 74). Subs not used: Wildsmith, Dielna, Buxton, Lee, Lavery. Birmingham: Randolph, Caddis, Robinson, Morrison (Spector 19), Grounds, Gleeson, Davis, Cotterill, Shinnie (Dyer 71), Gray, Donaldson (Thomas 83). Subs not used: Doyle, Novak, Reilly, Zigic.